MySleepyFerret » Mattresses » Which Is Better: Tatalay Latex or Dunlop Latex? Latex once known to be the luxurious sleep experience has become much more affordable as a bed over the years. They provide a natural contour to your body, being much more responsive than other types of foam to your sleeping position. Latex in general also sleep noticeably cooler than other foam mattresses as a more breathable material. 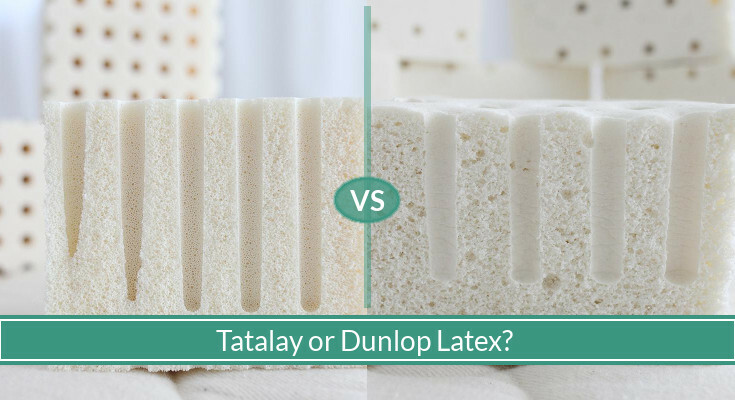 But what’s the difference between tatalay latex or dunlop latex? In this guide, we examine where latex comes from, how the two types of latex differ, and which might be better for you. 1 Where Does Latex Comes From? 2 What’s The Difference Between Dunlop And Tatalay? 3 Which Is Right For Me? Where Does Latex Comes From? Rubber trees that are grown in sustainable plantations are “tapped” for their rubber sap. The process involves extraction that drain a safe amount of sap from the tree without harming it so the tree can be used again next year. The rubber sap flows out of the tree as a white milky viscous substance that would be later processed and used in mattresses, pillows, medical and surgical items, gloves, boots, and so on. Rubber trees can produce latex for as long as 30 years. Eventually, the tree is harvested and cut down for other uses, and a new rubber tree is planted. One rubber tree can yield 15 grams of latex daily. To put things into perspective, a queen size mattress can require 2,500 trees to create. This vast amount of trees would span a field of 12 acres. The rubber for latex mattresses are commonly imported from countries such as Sri Lanka, Indonesia, Malaysia, and Thailand. The latex comes as all-natural and biodegradable, making it ecofriendly for use. Some manufacturers may mix other ingredients to create synthetic latex, making it much more durable and longer lasting. Both materials are proven to offer a comfortable sleep as well-known luxury foam-based beds. If you want to learn more about latex foam for beds, be sure to head over to our best latex mattress reviews guide for more information. What’s The Difference Between Dunlop And Tatalay? Both types of latex can use the same material, yet feel so different. The difference lies in their manufacturing processes. Tatalay takes a few extra steps to ensure its consistency. Dunlop has been the main process for latex manufacturing for decades. It involves the thick rubber sap extract being whipped into a froth, poured into a mold, steam baked, then cooling to create dunlop latex. As the particles cool, they settle unevenly at the bottom of the mold, making the bottom half firmer than the top. Tatalay still gets whipped into a froth then poured into a mold. After that, the mold is placed in a vacuum chamber with air sucked out of it. It is then flash frozen with chemicals, ending with baking. This makes tatalay latex much more consistent overall from top to bottom. Consistency: All else the same, dunlop tends to be denser than tatalay. This makes the material firmer, heavier, but ultimately much more durable. Tatalay provide a more consistent cell structure and tend to be softer and pillow-like. Tatalay is also tends to have more bounce than dunlop (without the spring-back of innerspring mattresses). Density: As we mentioned, dunlop tends to be denser as the substance settle and cool more at the bottom of the mold. Tatalay’s process create little airways and tunnels within the foam, making it lighter and softer overall. Firmness: Although dunlop can be arguably firmer while tatalay softer, it is worth checking the specific products on what level of firmness they use and whether you can ask for a custom comfort level. As a rule of thumb, you can expect dunlop to be a firmer choice than tatalay while tatalay provide a softer comfort than dunlop. Temperature and heat: If you sleep hot, you will notice a difference between the two constructs. Tatalay will be the cooler choice as airways are naturally created during the vacuum chamber process. The generally less density of tatalay also means more breathing space for heat to disperse. Tatalay often comes with a higher price tag. Due to the extra steps taken to produce tatalay latex and its consistency in quality, it is priced higher and often found in more higher class mattresses. Although both materials can have their place, tatalay’s consistency can play an important roll for the longevity and performance of the mattress. Although dunlop latex product process makes it cheaper overall, tatalay provide a much natural and luxurious feeling when you sleep on top of it. Tatalay is also better breathable than dunlop, with a more open cell structure. This helps provide the latex layer a comfortable temperature as heat gets pushed out through the tiny airways produced during the air vacuum chamber process. The bounciness of tatalay can also make a difference in the way you move around the bed during the night. With a more flexible and buoyant nature, the material stands out from other types of foam while still relieving pressure on common pressure points of the body. On the other hand, dunlop does tend to be warmer. For cooler climate and weather, sleepers can enjoy the warmth that dunlop can better offer thanks to its denser nature. Some sleepers who find their sleep disrupted by the bounciness of innerspring mattresses may also not enjoy tatalay’s bouncy feel and prefer the minimal disruptive bounciness of dunlop.